When the perfect couple’s marriage is threatened by the appearance of a sultry fashion model, are there any right choices? In 1950s London, Tom Knelston is charismatic, charming, with a passion for politics and reform. He is a man with ambition—and someone to watch. His wife Alice, a former nurse, shares his ideals. It seems they are the perfect match. 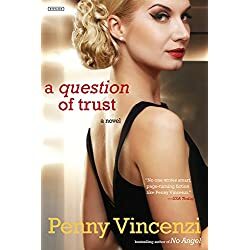 A Question of Trust is a vintage Penny Vincenzi novel: rich in characterization, life-changing decisions, love, desire, and conflict. “Seductively readable” (The Times), it is a luscious, page-turning read about a precarious situation—both utterly compelling and hugely rewarding.